Drilling continues unabated across the Pennsylvania landscape despite recent problems and a swelling of grass roots opposition. Claims made by energy proponents and corporations continue stating there is no threat to ground water. No credible evidence of problems despite using chemicals known to be toxic, radioactive and poisonous in the process. Energy production has returned to America! This is our energy solution for the next 100 years! It will end our dependence on foreign oil! Natural gas is much cleaner when it burns isn’t it? We all know that! Members of the government and political candidates are shouting the praises. Jobs will come back. Everything will be great. Just let us drill. The Federal land that is owned by you, the taxpayers, will be just fine. Leave everything to us. 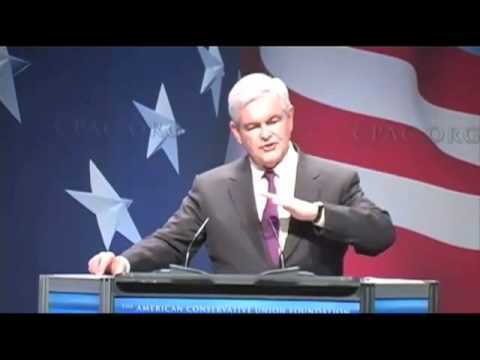 Wait a minute Newt (good to see you again by the way). You really want to stop the Environmental Protection Agency from protecting the environment? This technology has been around for decades and left unused because the dangers were realized. What about reports, from Fox News of all places, that air quality in parts of Wyoming (population .5 million), with 25,666 active gas wells 1, is now worse than Los Angeles (population 9.9 million)? Central New York should know better. The centerpiece that brought settlers to steal Iroquois land stands as a testament to the dangers of unbridled industrialization. Salt on the lake’s shores brought industry. The natural beauty of the area, along with the Erie Canal, helped Syracuse grow. In my great grandmother’s youth they still had carnivals on the winter ice. Today, Onondaga Lake is considered the most polluted lake in America by many. Industry began taking root in Solvay, a hamlet on the lake, in the late 1800s. Waste was dumped directly into the lake via pipeline. Later, mercury was also dumped directly into the lake. 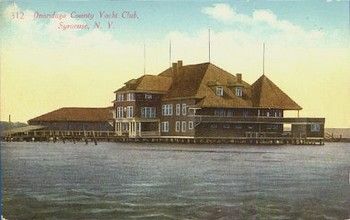 In the 1940s Onondaga Lake was declared unsafe for swimming. In the 1970s locals were warned against eating fish caught in the lake due to extremely high mercury levels. The 2005 estimate for the cost of the massive cleanup project currently under way was $451 million. Going to guess it runs over budget, if money still exists for the project. Now, New York is faced with a much further reaching decision. Should wholesale horizontal hydraulic fracturing be allowed in a state that spent the last forty years cleaning up from a century of industrial excess? Governor Andrew Cuomo is confident enough in the technology to keep the ban in place for the New York City watershed. Only farm land and the homes of New York’s rural residents will be destroyed. Unfortunately everyone seems to forget that all water is connected. Over half the human body is made up of water. 70% of the planet is covered by water. 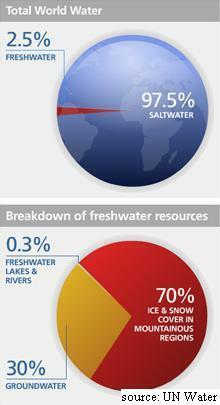 97% of water on the planet is salt water. 2% is frozen in glaciers. This leaves 1% of water on the planet that is fit for human consumption. 2 The vast majority of that is groundwater. Many are warning that water will become the commodity of the next century as population continues exploding unchecked. An attempt to privatize water in Bolivia over a decade ago resulted in popular riots over 200% price hikes, and the premise of a Bond film. Hundreds of different chemicals are used in the process of hydraulic fracturing. The concoction used each time may differ and vary from well to well. Not all chemicals are used at the same time. Gas companies claim only 0.5% of the slurry injected underground is made up of chemicals. Even if that is true and the chemicals are “typically confined by many thousands of feet or rock layers” 3 they are still now part of a system that we know very little about. I’m still waiting to see a map of how our aquifers are connected. Eight 8 ounce glasses of water per day x seven days a week x 52 weeks in a year x 0.5% = 1,456 ounces of chemicals, or 182 eight ounce glasses, ingested by a human being living above polluted water each year, if they drink the recommended amount. A major issue is what to do with all the waste water. Between one and five million gallons are used every time a well is fracked. A well may be fracked upwards of a dozen times. Multiple these figures by the tens of thousands of wells across America and the amount of water necessary is staggering. One group in Alberta concluded the amount of water needed to frack a well once could provide 17,500 homes with water for a day. Despite assurances from gas companies accidents have happened. 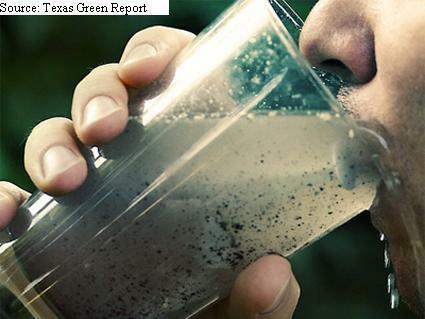 Water treatment plants are unable to properly clean the polluted water. Many treatment plants simply stopped accepting the waste water, leaving the question of what to do with it unanswered. The United State Forestry Service recently finished studying what happens when waste water is spilled. 80,000 gallons were dumped on a half acre of mature hardwoods. Two years later most of the vegetation is still dead and half the mature trees died as well. Industry personnel assured us that the waste water would have been spread over a larger area if they’d been in charge. They didn’t say it wouldn’t be dumped. They said they would spread the dumping out. Can we really trust what these people have to say? An unforeseen consequence of fracking is seismic activity. Since 2009 earthquakes have occurred around deep injection wells in the state of Arkansas. Gas companies dispose of waste water in these wells. From September 2010 to March 2011, there were more than 800 earthquakes. While relatively small in magnitude, the large number of earthquakes led to questions by some. Fracking is not necessarily the culprit. The fact that all earthquakes since 2009 occurred within six kilometers of these disposal sites, where millions of gallons of salt water are pumped underground, makes the evidence difficult to ignore. 6 Take a look at a USGS report here. Would you poison the food you eat? Another major concern that isn’t receiving the attention it deserves is the question about how the introduction of fracking fluids to water supplies affects livestock in the area. Cows, pigs and chickens all drink water. If that water is polluted then the livestock ingest whatever is in the water. The milk you drink, the meat you eat is created with these chemicals. Farmers have reported the sickness and death of animals in many places gas exploitation is happening. Listen to the horror stories of these Pennsylvania farmers. These are real people. These are not representatives pushing an agenda. Hear them. Their warnings are real. Their stories are heart breaking. America is addicted to oil. The last twenty years destroyed a trend toward less energy usage as Americans forgot they cared about the air and water that make up our world. While President Obama is pushing new gas mileage requirements on auto makers, it is too little too late. 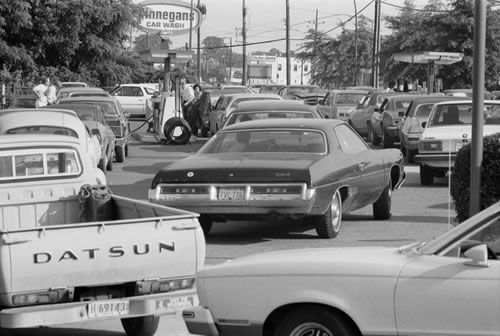 What America learned from the gas crisis forty years ago: Just pay the damn Arabs. Unless everyone decides to drive less and conscientiously use energy this graph is not going to change without major energy infrastructure alterations. Good thing America’s working on a reliable public transportation network. Oh wait… Good thing we’re investing heavily in alternative energy solutions (not drilling holes and burning things). Hrmmmm… Good thing Americans are still the hard working, self reliant group, so full of ingenuity, that built this nation. Oh dear… There may be problems ahead. Population continues growing unchecked while oil consumption increases. The only reason for the drop is the worst financial crisis in eighty years. New, actually clean energy is needed to address these issues. I’ve run out of time so this is the end for now. Care about your water. It’s the most important resource you have. This entry was posted in Hydrofracking, Ramblings and tagged corporate lies, horizontal hydraulic fracturing, hydraulic fracturing, hydrofracking, propaganda. Bookmark the permalink.